Cupcake Momma must have felt our black and white cupcake vibe. 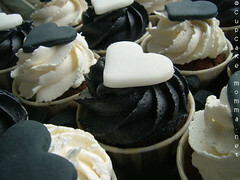 These are close ups of black frosting with white fondant hearts, and vice versa. how do you get black frosting? I think you can use Wilton's black coloring for this? I went to the multiply sites, they are also pretty but I must say that Cupcake Momma's has a flair in frosting.